The bourbon is out and the beer is in. After two weeks in the fermentor, I decided the rye Scotch ale was close enough to what I was looking for to move ahead to the barrel phase of the JD Project. Although the beer was still very young, it didn't have the overwhelming rye bite that my earlier batches had. Pitching only half the amount of yeast also helped the beer retain some of the body, while still reaching a respectable 8.1 percent A.B.V. (F.G.: 1.030) The alcohol percentage will climb higher, of course, after the beer spends a couple weeks in the bourbon barrel and then a month conditioning in the bottles, but it shouldn't taste too boozy (well, except for the booze it's aging in). I had wanted to get this project done last month so I could submit it into The Bruery's homebrew competition, but the extra time ended up working out for the best. I may have missed the competition (which I wasn't going to win), but I happened to get some good advice about barrel aging beer and maintaining the bourbon barrel at a brewing class I took yesterday. One of the homebrew clubs in Maryland, C.R.A.B.S., holds an all-grain class at Maryland Homebrew every couple of months. I signed up to see how much work is actually involved in all-grain brewing verses extract, which is what I've been doing so far. Turns out, it's not too hard. At least it doesn't look too hard. 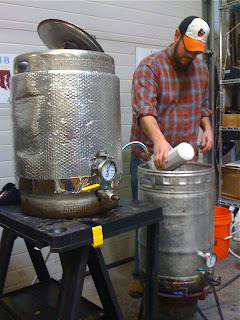 You need some extra equipment and it takes a few more hours to brew a batch of beer, but it all looked very manageable. With any luck, I'll be all-grain brewing by the end of the year. Not only will I have more control over the brewing process and my ingredients, but my cost per batch should also drop by $20-$25. 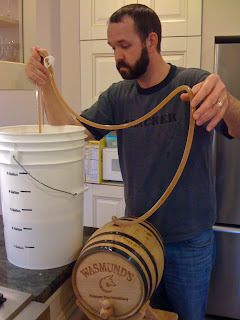 The guy who ran the class had some experience with barrel-aging beer and told me what I needed to do to keep my barrel in good shape between batches of beer. He also advised me to make sure the barrel was still wet with bourbon when I added the beer. People, that's good advice. What may be the best added benefit of this project is all the aged Early Times I now have. However, it's not as much as I started with. The 10 liter barrel held six large (1.75 liter) bottles of Kentucky bourbon. After seven months and two weeks, the barrel gave back roughly four and a half of those bottles. I knew I'd loose some volume to evaporation (the angel's share) and absorption into the wood (and the occasional quality-control check), but nearly three liters is a lot of loss. Ah well, I guess I'll have to make due with the eight liters I have left. So who needs a Manhattan?